The Android mid-range is a varied and wonderful place to be shopping in 2015. At one end, the Motorola Moto G is punching above its weight, while at the other, the Sony Xperia Z3 Compact is mixing it with the flagships. In particular, an injection of talent from China has really boosted and stimulated this portion of the market – which is where the ZTE Blade S6 comes in. At just £170 ($250, AU$314), the Blade S6 slips comfortably into that lower-mid range alongside the Moto G and under the OnePlus One. ZTE’s well-specced 5-inch phone has the raw ingredients to be a real contender at this price point, but lazy design could prove to be its downfall in an increasingly competitive market. 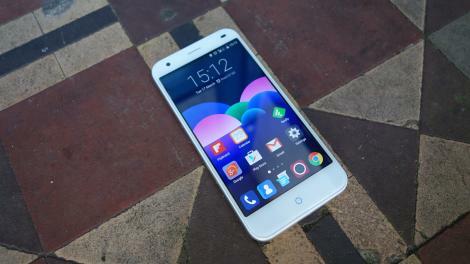 Let’s not pretend here – the ZTE Blade S6 design is a blatant copy of the iPhone 6. From its rounded corners and tapered display to its curved metal-effect edges and back, an initial glance is all that’s necessary to see through ZTE’s act. Unfortunately, a closer look reveals the folly of taking such a shameless approach in a cut-price handset. The inevitable unflattering comparison can only lead to disappointment and a far more critical appraisal than a more modest or generic design might elicit. That tapered display turns out to be ringed by a naff plastic rim, while the back and sides of the Blade S6 are formed of a tacky silver-painted plastic that’s both slippery and unpleasant to hold. The power and volume buttons are well situated on the right hand edge, and reasonably tactile in a clicky kind of way, but the capacitive keys below the display are just plain weird. There’s a permanently visible circular home key that seems to suggest iPhone-like functionality, but pressing it won’t wake the phone from sleep, despite that being your instinctive response. This home button doubles as a blue notification light, which also looks a little cheap and out of place. Either side of that home button are two dots that occasionally light up, providing the standard Android back and menu buttons. They’ve been left as dots because you can swap around their assigned functions, but it feels a little counter-intuitive not having them properly labeled. Matters improve with the ZTE Blade S6’s display. It’s only a relatively modest 5-inch 720p LCD effort, so it’s not particularly sharp compared to the 1080p efforts that are now making their way into mid-range fare such as the Honor 6 and (of course) the OnePlus One. However, it’s sharp enough for most tasks. The picture is nice and clear, thanks to in-cell technology that combines the digitiser and the LCD components into a single layer. Viewing angles are decent too, as befits an IPS screen. It’s not so long ago that in-cell and IPS screen technologies were signs of a premium handset. If I was to pick a nit here, it would be that the ZTE Blade S6 display’s maximum brightness setting seems a little on the low side. It’s not dim, but it only just feels like enough. Storage of 16GB is okay for a phone of this class, and you also get a microSD slot for expansion. This is accessed through a slightly ugly tray that requires a SIM tool, and is situated right alongside the SIM tray itself. Check out the press blurb surrounding the launch of the Blade S6, and you might be surprised to learn that ZTE views its Smart Sense function as the handset’s defining feature. I say surprised, because the feature completely escaped my notice for most of the time I spent with the phone. It’s turned off by default, and it’s not even labeled as Smart Sense on the phone. Instead, it’s buried away as part of the rather unassuming Gesture & Motion app. On the gesture front, there are the ultra-fiddly music app shortcuts that let you play and pause tracks by holding the volume down key and moving the Blade S6 in a V and a O shape respectively. This function is already off to a loser by virtue of the fact that it only works with the stock Music app, which will probably be sidelined by Google Music or your music subscription app of choice. It’s also just a really flaky system, and it’s much easier just to hit the power button and used the lock screen music controls that are baked into Android 5.0 Lollipop. The ability to silence alarms or answer phone calls by swiping over the phone when it’s lying flat on a table might have been of some use if it wasn’t so hit and miss, and the option to boot up the torch or calculator apps by shaking the phone is possibly the least reliable gesture of the lot. Smart Sense is a good idea, but the fact that it can be backgrounded and forgotten so readily tells you everything about its practical worth and usability. Another defining feature of the ZTE Blade S6 is its dual-SIM set-up. You can sit two nano SIMs side by side the SIM tray, allowing you to run two phone accounts from the one handset. This feature has been available for years in feature phones and smartphones in the developing world, but we only get the odd niche handset supporting the feature in the west. It’s actually very handy if you’re someone who has to lug two phones around with you – one for work and one for personal use. The execution feels a little clunky and shoehorned in here, but with Android 5.1 adding native support for dual-SIM set-ups, the ZTE Blade S6 should only get better in this regard once it receives the update. This is notable because the Snapdragon 615, while a decidedly mid-range chip, is built on a 64-bit architecture. This doesn’t make a huge difference in practical terms, but it does mean that the Blade S6 is future-friendly and well set-up for the 64-bit Android 5.0 Lollipop OS. Indeed, the fact that the ZTE Blade S6 comes with Android 5.0 Lollipop is a noteworthy feature in itself. What’s more, this is a pretty faithful version of Google’s most attractive and advanced mobile OS yet. Layered on top is ZTE’s MiFavor 3.0 UI, which is one of the less obtrusive and fussy custom Android interfaces manufacturers have come up with. Android 5.0’s core components are pretty much unchanged, including its slick menus, notification bar, and multitasking function. This is a very good thing, and actually makes the Blade S6 nicer to operate (in software terms at least) than many more expensive handsets from more established manufacturers. ZTE has made a couple of changes though, the most obvious of which is the fact that there’s no app tray. As in iOS, your apps are simply spread across however many home screens they need. You still get access to app folders, though, which can be set up by dragging and dropping the icons onto one another. There’s also a rather pointless personalisation menu here, which is initiated by swiping up on the home screen as in iOS 8’s quick settings menu. This offers instant access to background colour, wallpaper and menu animation changes. I’m not opposed to personalisation, but is this really the best use of such a readily accessible menu? We’d rather ZTE had used this gesture to provide quick access to handy tools such as the torch and the calculator, like in iOS 8. Still, if you download the Google Now Launcher, Google Camera, and Google Keyboard, you’ll essentially get something approaching a stock Android 5.0 Lollipop experience, which is pretty cool – and still all too rare. As I mentioned in the previous section, the ZTE Blade S6 runs on Qualcomm’s Snapdragon 615 CPU. This capable chip may be middle-of-the-range, but it has a couple of advanced features up its sleeve that serve to boost the ZTE Blade S6’s performance. The Snapdragon 615 is a quad-core (octa-core actually, but I’ll discuss that in the battery section) chip running at 1.7GHz. As stated, the headline spec here is the chip’s 64-bit architecture, though that doesn’t mean that it outperforms last year’s flagship 32-bit chip, the Snapdragon 801. As my Geekbench 3 benchmark tests reveal, the Snapdragon 615 chip (backed by 2GB of RAM) performs similarly to the Snapdragon 600 it replaces – that’s the chip that powered the HTC One M7 and other 2013 flagships – in single-core terms. When it comes to multi-core performance, which is useful for high-end tasks like 3D gaming, the ZTE Blade S6 and its Snapdragon 615 chip are roughly in the region of Snapdragon 800-powered devices like the Nexus 5. Or, to put it another way, the ZTE Blade S6 is pretty much halfway in between the Samsung Galaxy S4 and the Samsung Galaxy S5. Not bad at all for this price. Combined with a fluid and relatively unmolested Android 5.0 Lollipop OS, the ZTE Blade S6 performs brilliantly in general tasks, with navigation smooth and snappy. When pushing it a little harder with 3D games, performance remained strong. Real Racing 3’s impressive 3D racing was rendered pretty much flawlessly here, as was Trials: Frontier’s wince-inducing bike physics action. With the graphics settings bumped up to high, Dead Trigger 2’s advanced reflections caused the Blade S6 to strain a little, but it was still perfectly playable. All in all, you can’t get a better performing phone for less than £200. The ZTE Blade S6’s 2,400mAh battery provides adequate stamina – decent at a push – but it’s nothing special. After a day of moderate usage (with the phone switched to airplane mode overnight), I would find that the phone had less than 30% left in the tank. “Moderate usage” here involved 20 minutes or so of 3D gaming, a little light web browsing, and frequent email and text message checks and responses, with regular notifications coming through. When put through the standard TechRadar test of a 90 minute 720p video, with screen brightness set to full, the Blade S6 was left with 83% battery life. That’s pretty good going, and is roughly equivalent to the Honor 6 and the Samsung Galaxy S5. True, those phones have sharper, more power-hungry 1080p displays, but they also have significantly larger batteries. Aiding this battery life, the ZTE Blade S6’s Snapdragon 615 processor is built to ARM’s big.LITTLE standard, which means that it flips between two quad-core set-ups according to the intensity of the task at hand. All in all, you’ll be able to get through a day of usage fairly comfortably, but any more will be pushing it. The ZTE Blade S6 is a solid general performer, which is aided by that light UI layered over stock Android 5.0 Lollipop. This means that you get the stock Google phone and contacts apps, which serve the purpose of making and receiving calls very well indeed. That includes a smart dialer that predicts the number you’re dialing as you tap it out – whether numerical or alphabetical. Speaking of calls, call quality was fairly poor during my time with the phone. Calls were stable enough, but the sound was slightly muffled and distant compared to more premium phones like the LG G3. The standard messaging app feels a little out of place in this shiny Lollipop environment. Its design feels old fashioned, clashing with the aforementioned core phone and contacts apps. I’d recommend downloading Google’s own Messages app from the Google Play Store, which has a much more fitting Material Design aesthetic. When it comes to typing out those messages, though, the ZTE Blade S6 is quite strong. The TouchPal keyboard is one of the better default examples I’ve used, with a novel but genuinely useful swipe system for alternative characters. Inputting a comma, for example, is a simple case of touching the M key and swiping down. It’s quick and impressively reliable, and beats the usual press-and-hold technique hands-down. Visually, it doesn’t sit too well with the Material Design aesthetic that of Android 5.0 – it’s closer to the Jelly Bean and KitKat-era keyboard – but this was one of those rare cases where I didn’t feel impelled to head straight to the Google Play Store to download SwiftKey or Google Keyboard. As well as a by-now-typical joined-up typing system, there’s also an interesting new word prediction technology to the TouchPal keyboard that sees suggested words emerging from the relevant letters. You then pull the suggested words down to the space bar to select them. It wasn’t something I found compelling or useful enough to adopt in day-to-day use, but as ever with keyboards, it’s a very personal thing that will take a lot longer than a week to really click. If you’re thinking of consuming a lot of media on the ZTE Blade S6, you’re really going to need to bring along a set of headphones. Of course, we’d say that about any smartphone – even the HTC One M8 with its excellent BoomSound speakers. But in this case, the less you have to rely on the phone’s speaker the better. The Blade S6’s sole rear-mounted speaker is tinny and weedy, outputting an ear-achingly bad garble of noise for anything but the simplest of sounds. It’s clearly been an area of compromise. One area that ZTE hasn’t compromised on with the Blade S6 is the camera. It uses the popular 13-megapixel Sony IMX214 image sensor, which is the same component as can be found in the OnePlus One and the Xiaomi Mi 4 – two more well-specced, high-value Chinese smartphones. The result is that the ZTE Blade S6 takes reliably decent pictures in good lighting, with accurate colours and a pleasant SLR-style depth-of-field effect when taking close-ups. Indoors and low-light shots are a little fuzzy and murky, but that’s to be expected. There’s an HDR mode here that aids with those bright skies and deep shady areas, but my results with it were a little mixed. It invariably improved the skies in bright daytime shots, but the price for this tended to be a slightly false, otherworldly glow to the mid-ground or subject. The Blade S6’s camera app is a fairly accomplished affair, though it’s a little dated in appearance, and would benefit from an update to fit with its Material Design surroundings. It’s perfectly functional, though. Opposite the main virtual shutter and video controls there’s a prominent toggle (seemingly styled after the Blade S6’s ugly capacitive home key) that switches between Simple and Expert modes. Simple mode is the default point-and-shoot setting, and it’s all you’ll need for most shots – though of course there’s the now obligatory range of filters to help jazz things up. Expert mode, however, brings up settings for ISO, white balance and exposure, as well as a handy level guide and a manual spot metering tool. Video can be captured at 1080p, but the quality is nothing more than OK. There’s no OIS to keep things steady, and the audio capture in particular is pretty sub-standard, but it does the job. For such a cheap smartphone, the ZTE Blade S6’s camera is excellent, and is certainly a good level or two above the likes of the Motorola Moto G and other Android phones in this very reasonable price range. The ZTE Blade S6 offers decent specs and a pleasantly light customisation of Android 5.0 Lollipop for a very reasonable price, but its tacky and derivative design means that the phone isn’t the absolute pleasure to use that it should be. You don’t usually find such a capable, modern processor in a smartphone of this price, but that’s exactly what we have in the ZTE Blade S6. The same can be said for its 13-megapixel camera which, given enough light, takes better pictures than many smartphones that cost twice the price. It’s also good to see a manufacturer showing some restraint with the already-great Android 5.0 Lollipop OS, leaving the operating system’s core menus commendably untouched. While ZTE has made some smart choices with the Blade S6’s components, its design leaves much to be desired. The phone neither looks good nor feels very nice in the hand. Also, while it’s a light skin, what additions there are in the MiFavor 3.0 UI aren’t particularly memorable or useful. Finally, while the Blade S6’s 720p display is decent enough, you only need to spend a little more to get a decent phone with a superior 1080p option. ZTE has turned out a highly capable Android smartphone for a very reasonable price. In terms of power and photographic capabilities, it wipes the floor with the Motorola Moto G, which is only a little cheaper. However, ZTE could learn a thing or two about design from the current budget champ, as the Blade S6 simply doesn’t look or feel very nice in the hand. It’s not balanced or attractive enough to take the affordable handset crown, then, but power-hungry Android fans on a budget may want to consider it as an option.